Michael Cohen said yesterday that Trump was not joking when he said he could kill people, and, on top of that, that his supporters would stand by him. And he's already done it. His so-called "zero tolerance" policy has already killed two little children, and the Jerry Falwells of the world still support him. Cohen said that Trump would "not leave peacefully" if he lost in 2020, suggesting that Trump would call out his armed supporters to start a second US civil war. Thugs all over the world have been doing this for a long time, and now the President of the United States has spent 2 years praising them, sucking up to them, and telling them - strongmen like Bashir, Kim, Duterte, Putin, and Bolsinaro - that they should continue with their terror campaigns against their own people and their destruction of a free press and anything left of democracy in their regions. Of all the reasons to impeach this mob boss in the White House, this is the strongest. The United States must step back from the edge of becoming a Thugocracy, and that begins with nullifying the corrupted election of 2016. Article: "After Raising the Stakes for North Korea Summit, Trump Walks Away" by Uri Friedman. Article: "Michael Cohen concludes his testimony: 'I will not sit back'" by Matt Zapotosky, Karoun Demirjian, Rosalind S. Helderman, Rachael Bade and Shane Harris. Article: "House passes resolution to nullify Trump's national emergency declaration" by Erica Werner, Seung Min Kim, Paul Kane and John Wagner. Article: "U.S. House Democrats introduce sweeping 'Medicare for All' bill" by Yasmeen Abutaleb. Article: "House passes gun background check bill after GOP undocumented amendment" by AP. Article: "House passes another bill to strengthen gun background checks as Trump pledges to veto" by Jacob Pramuk. Article: "Pakistan India tensions: what we know so far about the conflict over Kashmir" by Ella Wills. Article: "Sanders, Pocan Lead Bill to Restore Workers' Rights" by Sen. Bernie Sanders. Article: "Professional Air Traffic Controllers Organization (PATCO) - August 1981 strike" by Wikipedia. Article: "Doggett, Brown Announce Bicameral Medicare Drug Price Negotiation Bill" by U.S Congressman Lloyd Doggett (D-TX) and U.S. Senator Sherrod Brown (D-OH). Article: "Medicare "Part E"- for Everybody" by Thom Hartmann. Article: "Iran nuclear deal framework" by Wikipedia. Article: "Elizabeth Warren opens door to reparations for Native Americans" by Annie Linskey. Article: "U.S. Rep. Pocan introduces student loan refinancing bill", 2013. Article: "A new model for the 21st century - Thugocracy" by Thom Hartmann. Article: "Rep. Matt Gaetz says he personally apologized to Michael Cohen after tweeting apparent threat" by Sean Rossman. Article: "'I was happy to do it for you': GOP Congressman Matt Gaetz overheard making admission to Trump about Cohen threat" by David Badash. Article: "Second Guatemalan child dies after being detained by US border agents" by Khushbu Shah. Article: "Michael Cohen: 'I fear' Trump won't peacefully give up the White House if he loses the 2020 election" by Kevin Breuninger, Dan Mangan. Quote: "I fear that if he loses the election in 2020, that there will never be a peaceful transition of power." - Michael Cohen. Video: "Trump: "I Could Stand In the Middle Of Fifth Avenue And Shoot Somebody And I Wouldn't Lose Any Voters"", January 23, 2016. Article: "Ivanka Trump doesn't understand work. No one in the Trump administration does." by Elizabeth Spiers. Tweet: "@Thom_Hartmann You're busted!" by Dane Winkler. Article: "Timothy McVeigh" by Wikipedia. Article: "Dem chairman closes Cohen hearing with emotional speech" by Brett Samuels. Video: Elijah Cummings' stunning closing remarks at Cohen hearing. Article: "Man pleads guilty in Washington pizzeria shooting over fake news" by Ian Simpson. Article: "Trump: I took Kim at his word over Otto Warmbier's torture" by Julian Borger. Article: "Sony Pictures hack" by Wikipedia. Article: "GOP group launches $2.9M ad campaign against Medicare negotiating drug prices" by Peter Sullivan. Article: "Israeli Prime Minister Benjamin Netanyahu to be indicted on corruption charges" by Yuliya Talmazan and Paul Goldman. Article: "'This is not a day at the beach': Pelosi tells moderate Dems to stop voting with GOP" by Heather Caygle and John Bresnahan. Article: "Shays' Rebellion" by Wikipedia. Article: "Whiskey Rebellion" by Wikipedia. Article: "Macron denounces nationalism as a 'betrayal of patriotism' in rebuke to Trump at WWI remembrance" by David Nakamura, Seung Min Kim and James McAuley. Article: "'Can we go home now? ': How conservative media downplayed Michael Cohen's explosive testimony" by Eli Rosenberg. Article: "Michael Cohen testifies behind closed doors at House Intelligence Committee following blockbuster hearing" by Jeremy Herb, Clare Foran and Manu Raju. Article: "Trump lawyers submit president's answers in writing to Mueller questions" by Tom McCarthy. Article: "Michael Cohen reveals Stormy Daniels check with Trump's signature" by MSNBC. Article: "Attorney General of New York" by Wikipedia. Article: "Michael Mann awarded the 2019 Tyler Prize for Environmental Achievement" by Penn State. Article: "New research suggests a dangerous climate tipping point - and we're nearly there already" (stratocumulus clouds) by Hunter. Article: "Arctic's strongest sea ice breaks up for first time on record" by Jonathan Watts. Article: "Atmospheric river, record snow: Extreme weather slams West Coast and Hawaii" by Jeff Berardelli. Article: "Time to Panic" by David Wallace-Wells. Book: The Uninhabitable Earth: Life After Warming by David Wallace-Wells. Article: "Empty skies after 9/11 set the stage for an unlikely climate change experiment" by Patrick Cain. Book: Dire Predictions: Understanding Climate Change by Michael E. Mann, Lee R. Kump. Article: "Jerry Falwell Jr. And A Young Pool Attendant Launched A Business That Sparked A Bitter Dispute" by Aram Roston. Article: "Bush and Evangelicals" by PBS. 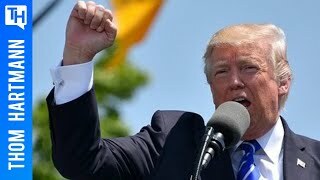 Video: 'Biography: The Trump Dynasty' Trailer â€“ Premieres Monday, February 25 | A&E. Book: Trump: The Art of the Deal by Donald J. Trump with Tony Schwartz. Tweet: "There is no longer a Nuclear Threat from North Korea." by Donald J. Trump, 13 Jun 2018. Article: "North Korea's missile and nuclear programme" by BBC. Article: "Dianne Feinstein rebuffs young climate activists' calls for Green New Deal â€“ video" by Sunrise Movement Bay Area. Article: "Energy Innovation and Carbon Dividend Act of 2019 (H.R. 763)" by Wikipedia. Article: "Oral Roberts" by Wikipedia. Quote: "These people don't want to govern, they want to rule" - Molly Ivins. Article: "Senate confirms Wheeler to lead EPA" by Miranda Green. Article: "FinCEN Fines Trump Taj Mahal Casino Resort $10 Million for Significant and Long Standing Anti-Money Laundering Violations" by Financial Crimes Enforcement Network. Article: "Trump's bid for Sydney casino 30 years ago rejected due to 'mafia connections'" by Christopher Knaus. Article: "The Turner Diaries" by Wikipedia. Article: "Russian agent's guilty plea intensifies spotlight on relationship with NRA" by Rosalind S. Helderman, Tom Hamburger and Michelle Ye Hee Lee. Book: Chosen Country: A Rebellion in the West by James Pogue. Book: Kingdom Coming: The Rise of Christian Nationalism by Michelle Goldberg. Professor Steve Keen will be here to talk about the U.S> heading for a 2020 recession..
Plus, Dr. Dena Grayson - Physician (MD), biochemist (PhD) and former Democratic candidate for U.S. Congress in FL-9, will be here to talk about the Cohen hearings, which she attended. And It's Anything Goes Friday! Will Republican Corruption Make Things "Pop Off" ? 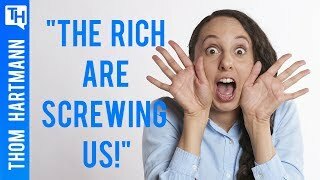 "We're Being Screwed" so These Companies Can Make a Buck! 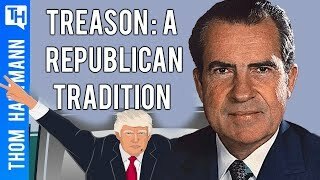 Will Republicans Hold Trump to the Same Standard They Did Nixon?